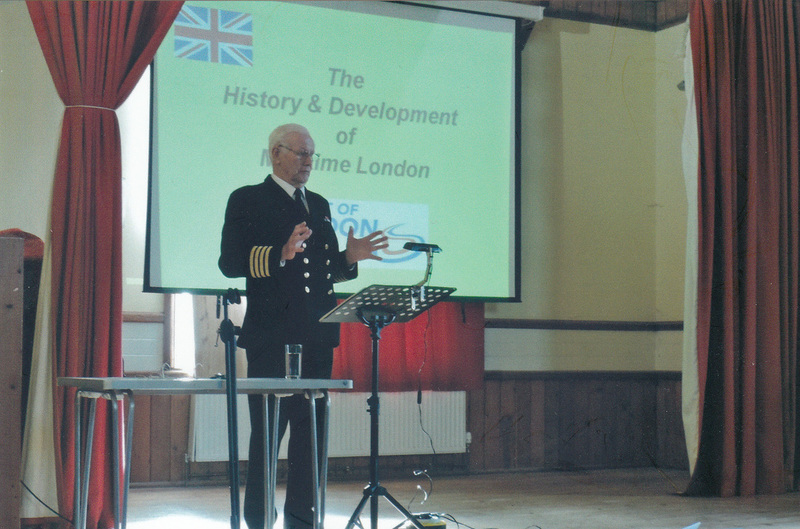 A thirty six year career in the Royal Navy – and more significantly as a Thames pilot – provided Captain Wells with a wealth of knowledge about the history of Maritime London which now covers an area of about 600 square miles along the Thames and incorporates London’s second financial centre of Canary Wharf (an area formerly occupied by West India Dock, which closed to commercial shipping in the 1980s), the Isle of Dogs and the City of London Airport, constructed on land formerly occupied by the Royal Albert Dock (almost three miles long) and King George V Dock. Captain Wells traced the development of London, firstly as a walled settlement named “Londinium” by the Romans in 43 AD through to it being established as a thriving commercial centre. It was during the reign of William the Conqueror in the 11th century that the White Tower was built (the central keep of the Tower of London). Later on, during the Wars of the Roses in the 14th and 15th centuries, Thames-side shipping trade flourished but the river also served as a facility for fishing, bathing and laundry and as a repository for human excrement. An embryonic maritime police force was established in 1798 to curtail the level of crime that had developed around the docks, but this was superseded by the formation of the Metropolitan Police in 1829. By the end of the 18th and the beginning of the 19th centuries, London had become the largest port in the world. Today, London Gateway remains the most important port in the country for cargo whilst Tilbury Dock is now the London Cruise Terminal and caters for ships requiring deeper water facilities. Captain Wells concluded his talk with a thumb-nail history of some of the principal buildings and historic monuments sited along the Thames: notably, the Royal Naval College, the National Maritime Museum, the Queen’s House and the Royal Observatory - all of which are within Greenwich Royal Park – but not forgetting London’s oldest riverside pub built in 1520 (“The Prospect of Whitby”) and the “Cutty Sark”, a 19th century tea clipper, now most beautifully restored and attracting millions of visitors a year. After a question and answer session, Colin thanked Captain Wells for his most interesting talk.